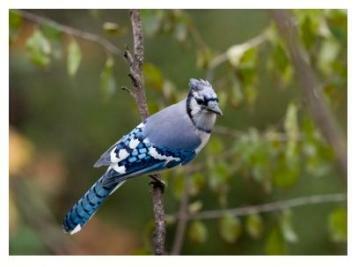 The Blue Jay, raucus & extrovert - the noisy bird at the feeder! 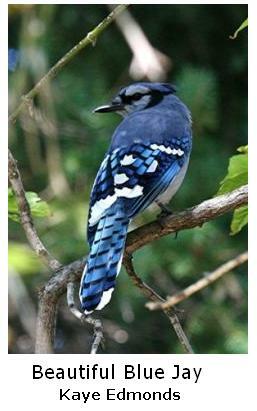 The beautiful Blue Jay is a common bird in Southern Ontario and stays in the area all year long. A member of the Crow family, this is a medium sized bird with a blue head and back, black neck-band and light grey feathers underneath. This handsome fellow is showing off his lovely spotted wing and tail feathers for the camera! This is an unmistakable bird, both for its beautiful, bright plumage and for its noisy raucous call. The male and female birds are of similar size, although the female is slightly smaller, both birds exhibit a crest. Their preferred habitat is wooded areas of both evergreen and deciduous trees, they also live in inhabited areas and are frequent visitors to the fird-feeders. To view a charming short YouTube video of a pair of Blue Jays as they gather materials with which to build their nest (courtesy of Zach Glenwright) just click here. These birds enjoy a wide variety of food and are opportunistic in their approach to their diet - fruits, insects, grains, and acorns. Sunflower seeds and Peanuts are especially popular at our bird-feeders. Unfortunately, they will occasionally eat the eggs and nestlings of other birds, which makes them unpopular with my family, however, it should be noted that the bulk of their diet consists of vegetable material such as wild fruits, acorns, hazelnuts, beechnuts, corn, and other grains, and also insects of many kinds. This Jay is taking a peanut - possibly to hide for later. Tent Caterpillars are another important food for the Blue Jays and can be important in the local control of them. One pair may feed hundreds of the caterpillars to their nestlings in early summer. The parents remove the caterpillars from their tough, silken cocoons and feed them to their young. By destroying the cocoons, the Jays are eliminating thousands of moth eggs, which would hatch into moths. 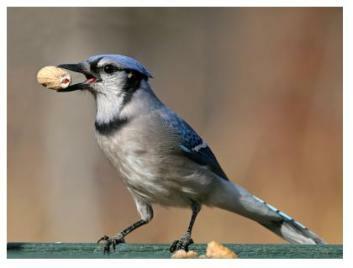 When we feed Blue-Jays we thread peanuts on string and tie them to the trees or bird-feeder, so that the Jays have to stay and eat them where we can see them, otherwise they come to the feeder, grab a nut and immediately fly away! These are handsome birds, noisy and inquisitive. They add life to the forest and garden at any time of the year, but especially in winter when most of the other birds have moved south. Their loud calls of "jay jay" and "too-wheedle, too-wheedle" are heard at all times of the year, but they are often noisiest in the autumn. In early summer, the mother Jay lays 4 to 5 mottled greenish-buff eggs in a nest made of sticks, moss and grasses, which they incubate for around 18 days. Typically, parent Jays will raise one clutch of chicks each year.